Everyone's Favourite Toxic Wasteland Is Ours! After a couple of false starts in the past few weeks, we successfully conquered Quesh today, hurrah! Contrary to my initial post about there being no real threat to us, Czerka Oy invaded the next day and gave some of us a bit of a panic attack when they pushed to overtake us on their first day... but we fought back and eventually emerged victorious. There was also a bit of a scare on Monday when Fallen Exsilium suddenly seemed to wake up, but nothing really came of that either (everyone getting really frantic just meant that we got even more ops done). Thanks for everyone's contributions this week - as you can see in the Conquest Point Tracking thread, it was a real team effort. Right now it looks like we might be able to score another first place victory on this week's small yield planet, CZ-198. Keep an eye on that scoreboard and get in on the action! 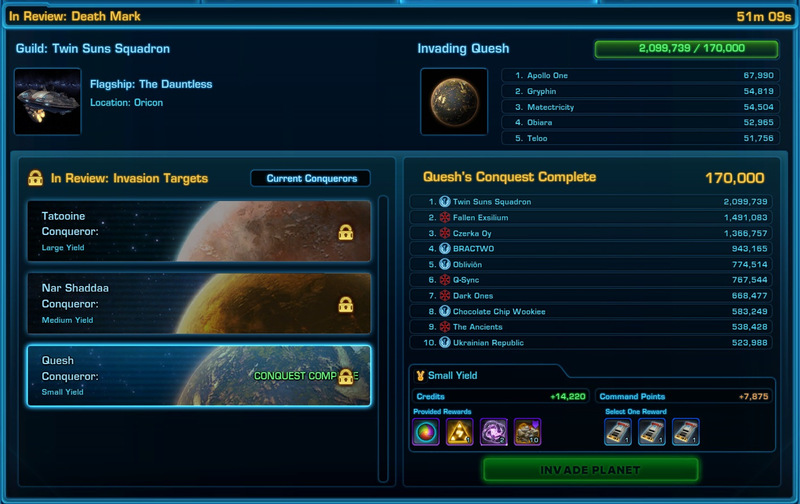 Well done on last week's conquest everyone! 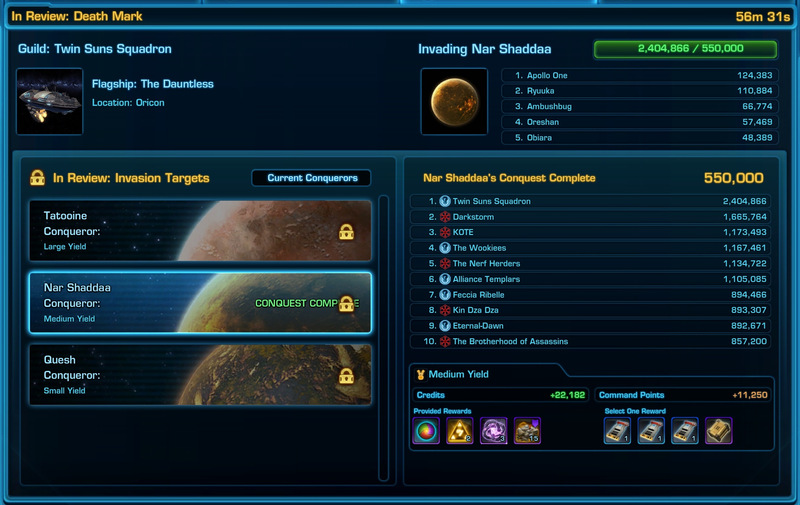 We were once again victorious and managed to claim Nar Shaddaa for the Twin Suns for the first time. At least for the first few days it was quite an exciting race as well, as Darkstorm was pushing hard and first place kept changing back and forth between the two of us, but eventually a dedicated push involving operations and world bosses on our end left them despirited and in the dust. Everyone's contributions can once again be seen in the Conquest Point Tracking thread, but special thanks to everyone who organised events, even if they themselves weren't necessarily that into conquest themselves. Apollo even had the sense to organise a KP run before we'd even decided to invade, how's that for foresight? Also noteworthy are the many people who tirelessly ground rampages every day (something I consider quite a sacrifice, considering that I find them very boring myself), and the amount of excited chatter in Discord whenever the scores changed, including a certain someone posting multiple status updates per day (coughOricough ). Our final score of over 2.4 million points was our highest so far for a week in which Xen couldn't simply carry us to victory by lots of crafting - and it's a target we may well have to achieve again, because our ambitions know no bounds and we're going for first place on Oricon this week! This time we're not just up against Darkstorm but also against Rapid Serenity, of whom we know that they are also capable of scoring up to at least 2.4 million points, so it could be a tight race! Give it your best and look to Discord and guild chat once again for helpful advice and events to join for extra points. The battle for Alderaan started off quite intensely, with Twin Suns and Eternal Serenity initially going neck on neck for the first couple of days or so, but then we pulled ahead and never stopped again, eventually finishing the week with a score that was nearly twice as high as theirs (not to mention a new personal record for us), and that despite of our two biggest contributors to Conquest ostensibly having taken the week off. 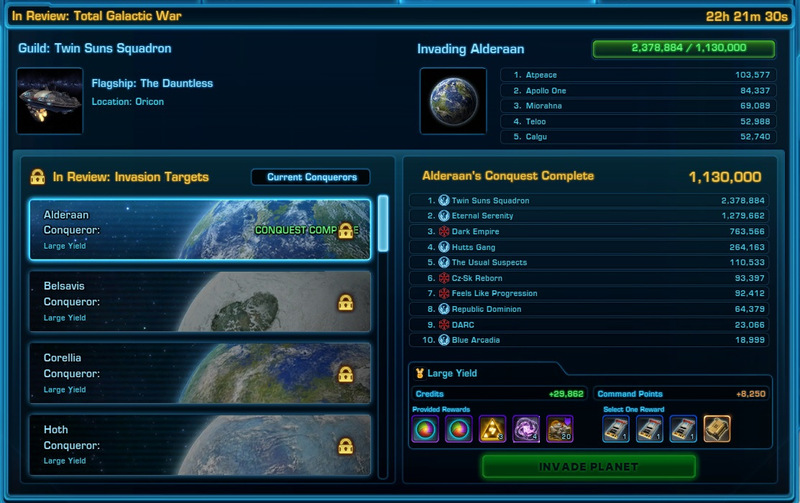 That aside, make sure to reap your just rewards come Tuesday by logging into every character that hit their personal target, so you can claim your usual quest reward as well as your new Conqueror of Alderaan legacy title! Then go to Alderaan and take lots of screenshots of yourself with the title and the "Conquered by: Twin Suns Squadron" plaque showing. 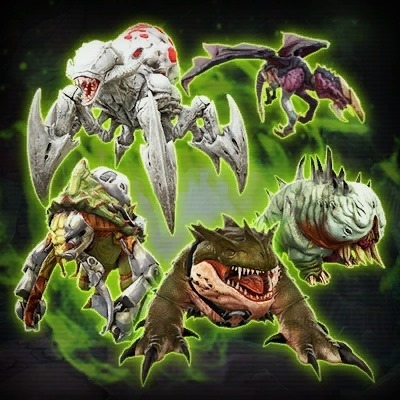 Next week we'll be taking it easy after all that excitement, but you can fully expect us to go for gold again the next time Total Galactic War comes around!